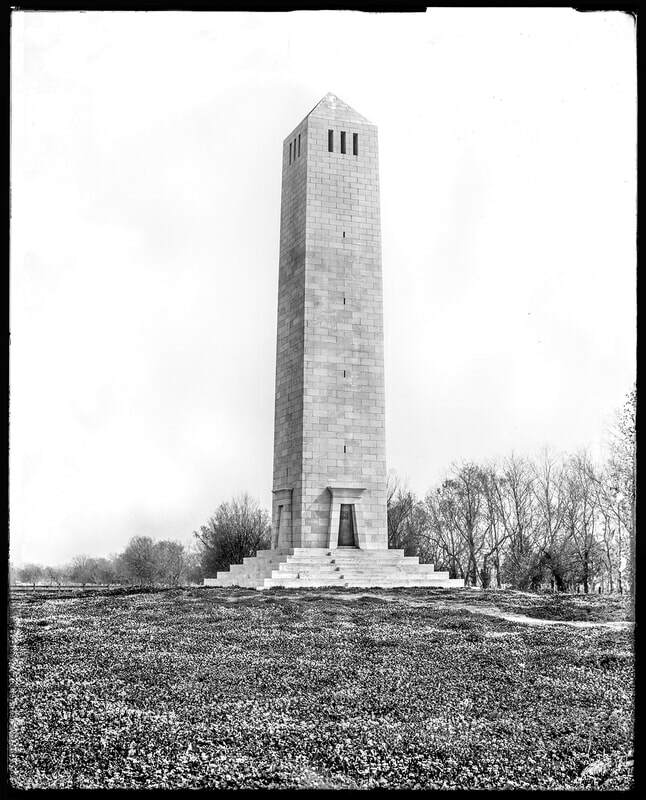 Photo shows the Chalmette Battlefield in New Orleans from the monument. The view is toward the northeast, parallel with the American defenses. The 3 closest cannons are replicas while the 2 farthest are authentic French pieces, one from 1793. 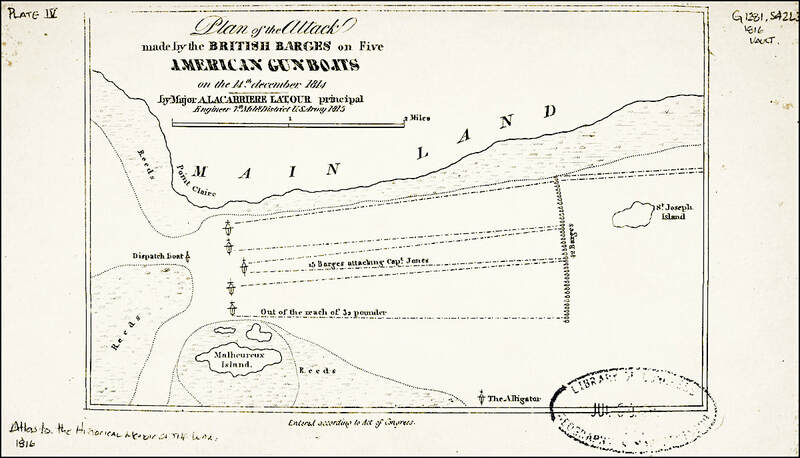 The main British attack was aimed just beyond the two farthest cannons at Batteries 5 and 6. Click image for link. Click here or on image above to read the book. The British campaign to advance on New Orleans is highlighted in red, and the American fortifications along the Mississippi River defending New Orleans is highlighted in blue. 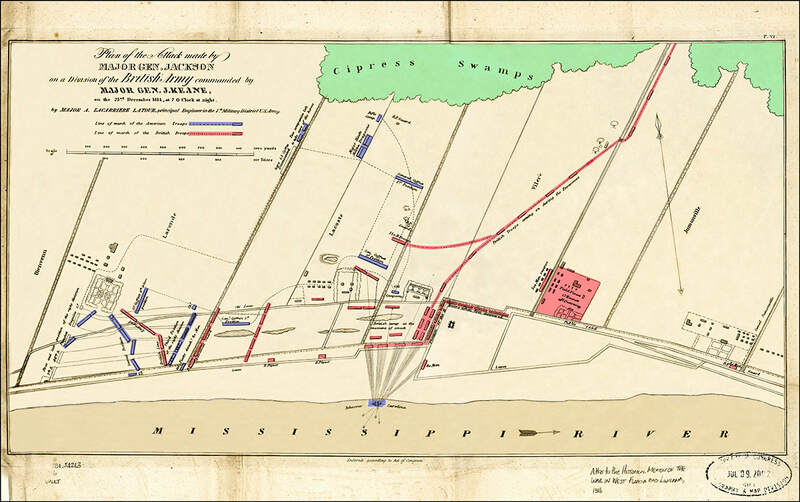 The map shows the advance of the British navy up the mouth of the Mississippi River to the fortified battery at Fort St. Philip, and the British troop movements by barge across Lake Borgne, and their retreat back to the main British fleet anchorage in the straights of Ship Island. 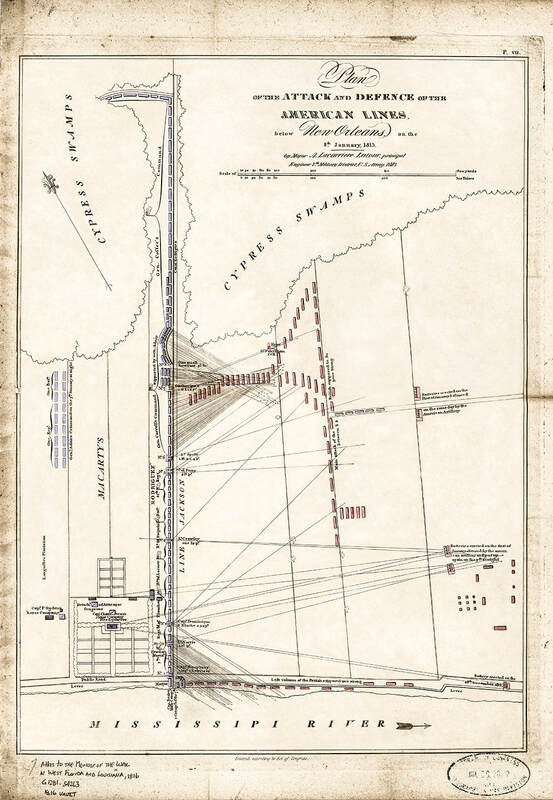 The map also shows the march of General Jackson's troops in his expedition against Pensacola. On December 9, British Commander Vice Admiral Sir Alexander Cochrane's fleet was sighted off the Louisiana coast. The British had three warships, HMS Seahorse, Armide and Sophie sailing for Lake Borgne to secure a beachhead for the troopships for the assault on New Orleans. There was some light resistance from American gunboats around Cat Island Pass off the coast of Mississippi. On their approach to Lake Borgne, the British encountered the American schooner Sea Horse who was on a mission to destroy a powder magazine at Bay St. Louis in order to prevent its capture. The schooner, with the protection of a shore battery, fought off two longboat attacks but was burnt later that night to prevent her capture by the British. Commodore Daniel Patterson of the New Orleans Squadron, commander in charge of the naval defenses for the city of New Orleans sent 5 gunboats to form a blockade in Lake Borgne. The one-gun schooner USS Sea Horse and 2 support vessels were dispatched as support for the gunboats. The American squadron comprised 245 men, sixteen long guns, fourteen carronades, two howitzers and twelve swivel guns. On December 11th, Admiral Cochrane ordered the British naval forces to run down and defeat the American flotilla. On the night of December 12th, the British deployed 14 warships, 1200 sailors, and Royal Marines, 42 longboats, launches and barges to Lake Borgne to run at the American blockade. On the morning of December 14 at 10:00 after 36 hours of rowing, and just out of firing range of the American gunboats, the British had their breakfast- the attack on the blockade began at 10:30, and in the first engagement, the British spotted the USS Alligator, cut her off and captured her. On the morning of December 23, General Keane and a vanguard of 1,800 British soldiers reached the east bank of the Mississippi River 9 miles south of New Orleans after marching 36 hours from Lake Borgne. It was here that the first major blunder of the British campaign was made. General Keane could have marched into the undefended city by advancing for a few hours up the river road, but he decided to encamp at Lacoste's Plantation, rest his troops, and wait for reinforcements. You can click anywhere on the map to zoom in for a better view. Click here or on either page to read Gleig's book. General Jackson learned of the advanced position of the British and realized he couldn't wait till morning to confront the British forces. General Jackson sent out an order to his commanders to muster their troops. That evening at 7:00 Jackson attacked from the north with 2,131 men in a brief three-pronged assault on the unsuspecting British troops. Jackson then pulled his forces back to the Rodriguez Canal, about 4 miles south of the city. The Americans suffered 24 killed, 115 wounded, and 74 missing, while the British reported their losses as 46 killed, 167 wounded, and 64 missing. It was General Jackson decision to strike first, and the skirmish below New Orleans on the evening of December 23rd, that may have saved the city. The night attack on the unsuspecting British troops, and General Keane's reluctance to advance on the city without reinforcements gave Jackson the time to withdraw upriver to within 4 miles of the city, and begin fortification of the Rodriguez Canal. The American Navy bought the USS Carolina in 1812 while her keel was still being laid down in Charleston. 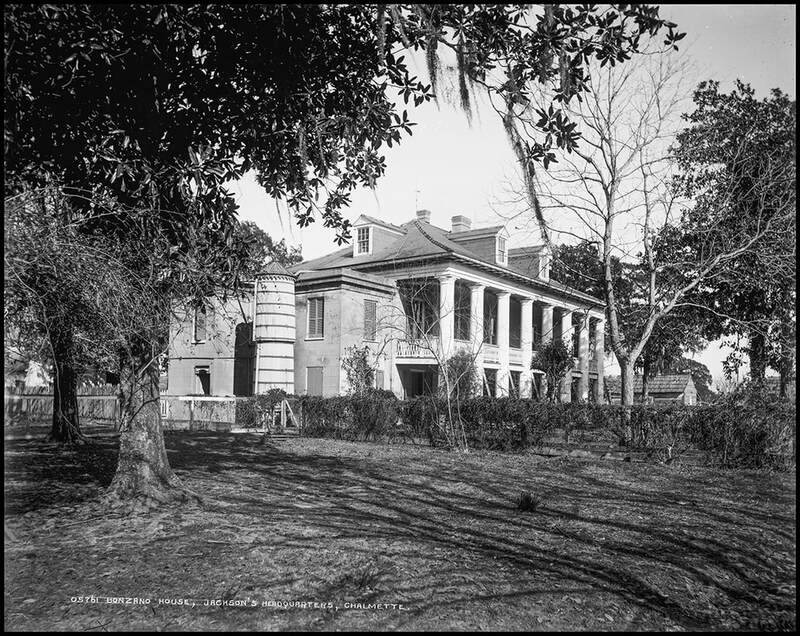 It was the Carolina that destroyed Lafitte's stronghold in Barataria Bay near the mouth of the Mississippi River. The USS Carolina slipped down the Mississippi River on the evening of Dec 23,1814, and quietly laid anchor on the opposite side of the river from the British encampment. Her crew began shelling the British troops with grapeshot and cannon balls in what the soldiers thought was going to be a restful night. General Edward Pakenham arrived on December 25th, and took over command of the British forces. On the 28th a scouting party was ordered by Packenham to determine the strength of the American troops assembled behind the canal. When the British scouts withdrew, the Americans began building earthworks to protect the cannon installations on the Line Jackson. The Americans installed eight canons; a 32-pound gun, three 24-pounders, one 18-pounder, three 12-pounders, three 6-pounders, and a 6-inch mortar. A detachment was also sent to the west bank of the Mississippi to arm the grounded warship USS Louisiana. General Pakenham, realizing the disadvantage in which the army had been placed, met with General Keane and Admiral Cochrane to plan their attack. General Pakenham wanted to advance up Chef Menteur Road, but Admiral Cochrane believed the veteran British soldiers, and his boats and seamen, could easily take Jackson's ramshackle army. General Packenham was overruled, and the second blunder of the British campaign was made by Admiral Cochrane. Jackson's force was greatly outnumbered by the British. Jackson's total of 4,732 men was made up of 968 United States Army regulars, 58 United States Marines, 106 seamen of the United States Naval Battalion, 1,060 Louisiana militia and volunteers (including 462 free people of color), 1,352 Tennessee militia, 986 Kentucky militia, 150 Mississippi militia, and 52 Choctaw warriors, along with a force from the pirate Jean Lafitte's Baratarians. Jackson also had the support of the warships in the Mississippi River, including USS Louisiana, USS Carolina and Enterprise, a steamboat. An artillery bombardment of the American earthworks began when the main British army arrived on New Year's Day, 1815. The artillery exchange lasted for three hours, knocking out 3 of the 8 American canons, and doing considerable damage to the earthworks. General Pakenham withdrew his troops when the supporting field artillery ran out of ammunition, and decided to wait for his entire force of over 8,000 men to assemble before continuing his attack. The left side of Line Jackson had abandoned their positions under heavy British fire. Had Packenham continued the assault on Line Jackson the battle for New Orleans might have ended badly for the Americans. British troop movements and artillery installations from December 27th to the battle formations on the eve of battle on January 8th. The location of the American gunboat Carolina during the December 23rd night attack on the British forces to the 27th when she caught fire and blew up from red-hot cannon fire from two artillery batteries stationed directly across the river. The American ship Louisiana is towed out of harms way on December 27th, and anchored in support of Line Jackson . The British troop movements highlighted in red shows the road the British engineers made through the dense marshland and swamp from Lake Borgne to the banks of the Mississippi River on December 23rd. 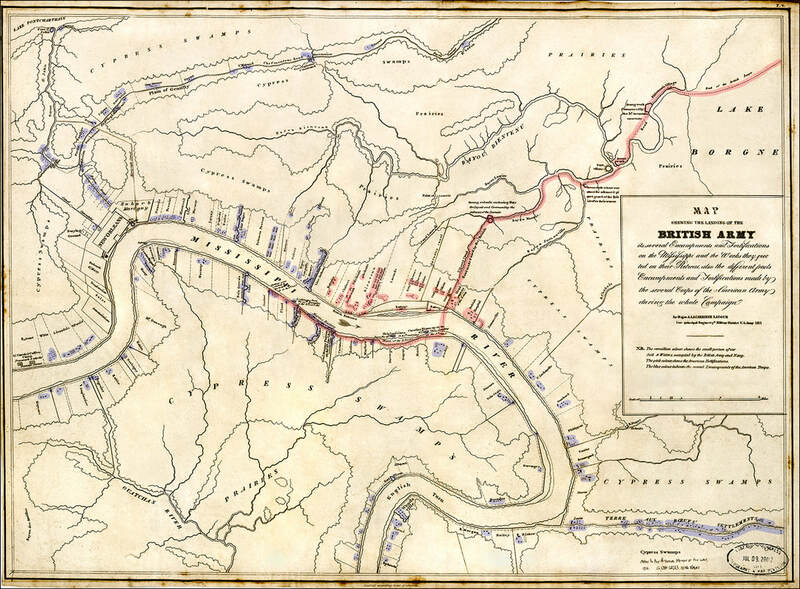 The map also shows the British troop movements during the battle on January 8th when they crossed the river and reached the furthest point of their advance on the city of New Orleans before retreating. 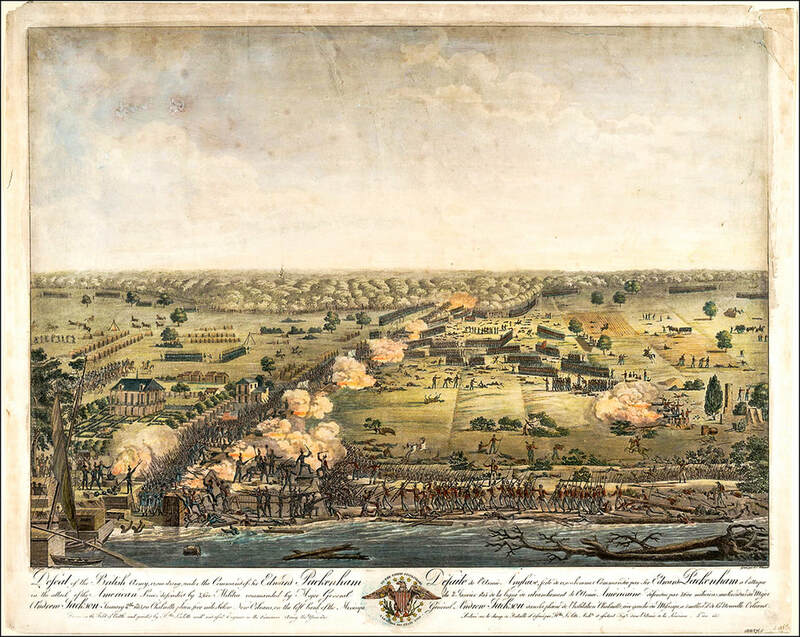 Extreme obstacles faced the British in their campaign to take the city of New Orleans. An assault from the mouth of the Mississippi River was repulsed by fortified American defensive installations at Fort St. Phillip on both sides of the river. 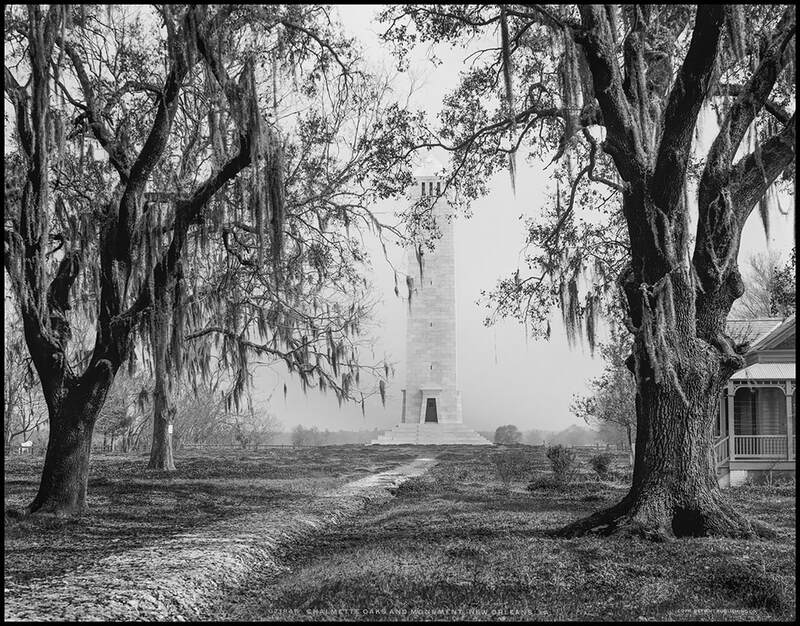 The swamp and marshland proved to be more difficult than expected with time lost costing the British the element of surprise. They found themselves hemmed in with the Mississippi River and swamp on their flanks, and Line Jackson blocking their advance on the city. 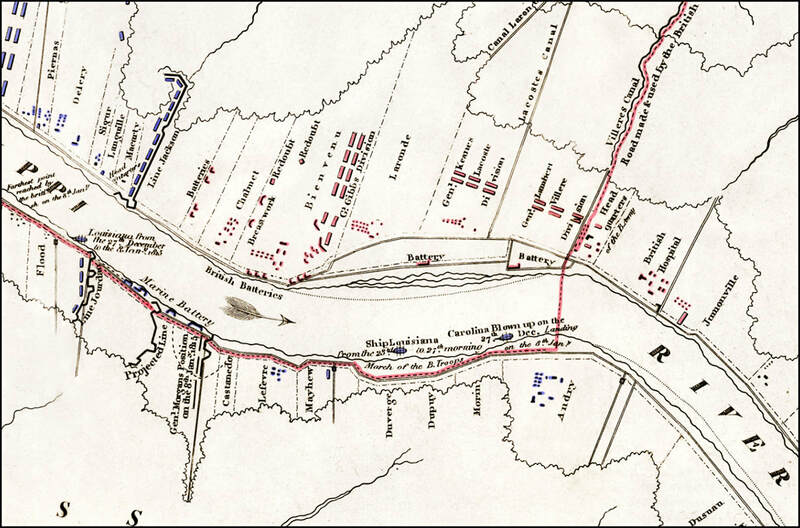 When General Pakenham ordered his troops to advance on the General Jackson's heavily fortified line over open terrain, and they were unmercifully cut to pieces. When Pakenham fell in battle along with many of his officers, the British requested a truce to collect the dead and wounded from the battlefield. The Americans helped bury the dead, and took in the British wounded and as it was customary for the victorious side to care for the wounded on both sides. The British used the cease fire to quietly retreat using the same route to get back to their ships. With no trees or other materials for building a road, the British retreat bogged down in the knee-deep mud, adding insult to injury. ​ Winston Churchill said that throughout the history of British battle strategies, the campaign to take New Orleans was the most ill planned. Print (above) made from engraving is an allegorical reference to the Treaty of Ghent which ended the war 1812, showing Minerva dictating the terms of peace, which Mercury delivers to Britannia and Hercules compels her to accept. 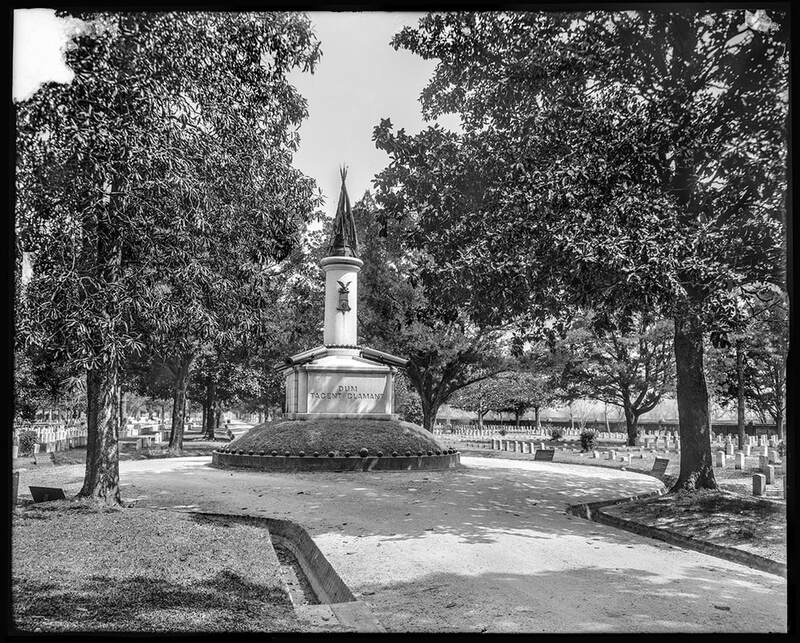 The monument on the left is similar to the Chalmette battle field monument for the Battle of New Orleans that can be seen in the photograph below. A halftone photomechanical print of a cover for TheYouth's Companion magazine printed in 1922. The Youth's Companion (1827–1929) was a children's magazine in print for over one hundred years. On September 8, 1892, the magazine published the first copy of the Pledge of Allegiance, written by staff member Francis Bellamy. Francis Julius Bellamy (1855 –1931) wrote the original version of the U.S. Pledge of Allegiance. Bellamy was a Christian socialist who "championed 'the rights of working people and the equal distribution of economic resources, which he believed was inherent in the teachings of Christianity. In 1888, the Youth's Companion magazine became a supporter of the school flag movement, and in 1891, Bellamy was hired by Youth's Companion to organize a campaign to sell U.S. flags to public schools to boost subscriptions. By 1892, the magazine had sold U.S. flags to approximately 26,000 schools. During the 400th anniversary of Christopher Columbus reaching the Americas, the magazine called for a national public school celebration. A flag salute was to be part of the official program to be held in schools all over the United States. Francis Bellamy's pledge was published in the September 8, 1892 issue of Youth's Companion. Bellamy won the support of school superintendents, and the National Education Association, for an official program for schools to follow, and structured a program around a flag-raising ceremony and his pledge. I pledge allegiance to my Flag and to the Republic, for which it stands, one nation, indivisible, with liberty and justice for all.